What does being nobody without God really mean? I cannot become without God. I cannot believe without God. I cannot breathe without God. I cannot cook without God. I cannot dream without God. I cannot eat without God. I cannot feel without God. I cannot forgive without God. I cannot be forgiven without God. I cannot heal without God. I cannot hear without God. I cannot possess the promise without God. I cannot sit without God. I cannot speak without God. I cannot stand without God. I cannot taste without God. I cannot teach without God. I cannot think without God. I cannot walk without God. I cannot write without God. 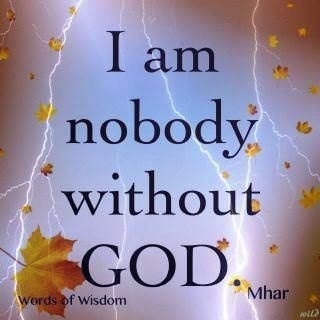 I simply cannot exist without God. What does being nobody without God, really mean to you? THE ”Day 246 – I Cannot” (TEXT) BY EYHCS IS UNDER A CREATIVE COMMONS ATTRIBUTION-NONCOMMERCIAL-SHAREALIKE 4.0 INTERNATIONAL LICENSE.